This morning you will be transferred to the ferry terminal. You will take the 25 minute crossing to Gozo. Your tour starts with a visit to the Ggantija Prehistoric Temples in Xaghra. The Ggantija temples are the earliest of a series of megalithic temples in Gozo. Their makers erected the two Ggantija temples during the Neolithic Age (c. 3600-2500 BC), which makes these temples more than 5500 years old and some of the world's oldest manmade religious structures. The tour will continue with a visit to Calypso’s Cave. This cave is situated in a cliff face, a short distance from Xaghra and overlooks the red sands of Ramla Bay. From here you will proceed to Dwejra to see the "Azure Window", Fungus Rock and the Inland Sea. The Azure Window is another spectacular natural landmark in Dwejra, along with the Inland Sea and Fungus Rock. Afternoon you visit the Citadel including Gozo's Cathedral and Museum in the capital Victoria followed by a stroll along the Bations of the citadella where one can view a large part of Gozo from its highest peak. Finally you embark the ferry at Mgarr Harbour to return to Malta. Today you head to the Three Cities after a brief drive through Senglea and Cospicua, you will stop at the waterfront of the city of Birgu which was established on the Grand Harbour of Malta around Fort St. Angelo, and served as Malta's principal harbour. When the Knights of St. John arrived in 1530, they made Birgu the capital city of Malta, since the former capital, Mdina, was inland and did not suit their naval requirements. A brief tour around the Collachio (an area reserved only for the Knights) will show you the many old Auberges of the Knights, and the Inquisitor’s Palace. Later visit to the Maritime Museum and Inquisitors Palace. Afternoon you visit the temple of Hagar Qim which was excavated for the first time in 1839, and dates from the Ġgantija phase (c. 3600 - 3200 BC). It stands on a hilltop overlooking the sea and the islet of Fifla. Ghar Dalam Cave is another very important site you will visit, as it was here that the earliest evidence of human settlement on Malta, around 7,400 years ago. After Ghar Dalam you will visit the Tarxien Temples which are the most complex of all temple sites in Malta and dates back to 3600 to 2500 BC. The temples are especially renowned for the detail of their carvings, which include domestic animals carved in relief, altars, and screens decorated with spiral designs and other patterns. The entire city of Valletta, Malta’s capital, is inscribed as a UNESCO World Heritage Site. Your first stop will be the Upper Barracca Gardens which are built on the defensive bastions that surround this majestic city. These gardens, built by the Knights of St. John, command breath taking views of the Grand Harbour. You proceed past the Auberge de Castille et Leon, formerly the official seat of one of the most powerful languages of the order and now the Office of the Prime Minister of Malta. Later you head to St John's Co-Cathedral, with its impressive display of Baroque treasures and the Cathedral Oratory, home to the largest single work by Caravaggio, and his only signed work. Your next stop will be the Palace of the Grand Master and Museum of the Knights of Malta. After Lunch you will head up to Mdina The history of Mdina traces back more than 4000 years. Lamp lit by night and referred to as “The Silent City”, Mdina is fascinating for its timeless atmosphere as well as its cultural and religious treasures. During your tour you will stop at the Bastions of Mdina where one can admire the extensive views of Malta from one of the highest points on the island. After breakfast you depart for the Grand Harbour for a detailed tour. The rest of the afternoon will be at leisure allowing you to explore the numerous high street shops. Alternatively a visit to one of the beaches in the north of the island can be arranged. This day will be completely at leisure where you will be able to visit any areas of the island that you prefer. 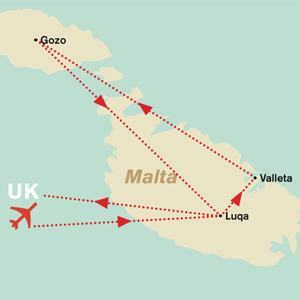 After breakfast you will check out and depending on the time of your flight, transfer to Malta International Airport for your retrurn flight back home.